This qualitative study investigates the efficacy of Ideas Videos (or iVideos) in pre-service teacher education. It explores the experiences of student teachers and their lecturer engaging with this succinct, advocacy-style video genre designed to evoke emotions about powerful ideas in Education (Wong, Mishra, Koehler, & Siebenthal, 2007). The findings indicate this generative task, involving student teachers as filmmakers, leveraged rich outcomes in relation to their professional knowledge development. The study adds to the growing literature base espousing the significant roles of learner-generated digital video projects in teacher education. Kearney, M. (2013). Learner-generated digital video: Using Ideas Videos in Teacher Education. 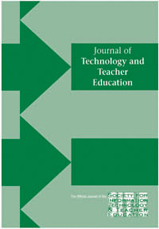 Journal of Technology and Teacher Education, 21 (3), 321-336. Waynesville, NC USA: Society for Information Technology & Teacher Education. Retrieved April 21, 2019 from https://www.learntechlib.org/primary/p/41935/.